June 23, 2008 / A massive electrical storm on Saturn as photographed by the Cassini probe. Electrical storm on Saturn by Cassini probe. 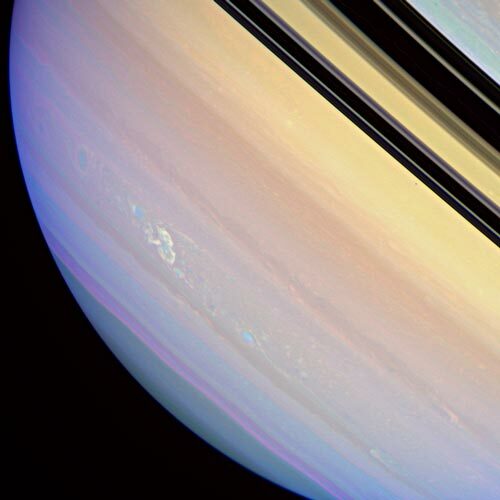 This colour-modulated shot of Saturn was taken by the Cassini orbiter in March of an electrical storm that “penetrates from Saturn’s lower to upper troposphere” according to the imaging team. Sounds… large. The lighting produces radio frequencies that scientists use to measure it’s intensity. Meanwhile, Australian amateur astronomer Trevor Barry is making the news for his photos of the same weather event, taken at his home in Broken Hill. Here’s a NASA news roundup that contains a quick grab of Trevor talking about it. Researchers collect amateur evidence because the spacecraft cannot monitor the storm continuously. Massiveness—inherently newsworthy and interesting!